Her fashion brand, now featured at 341 FSN, shares uplifting messages of empowerment. To see change, someone has to make it happen. 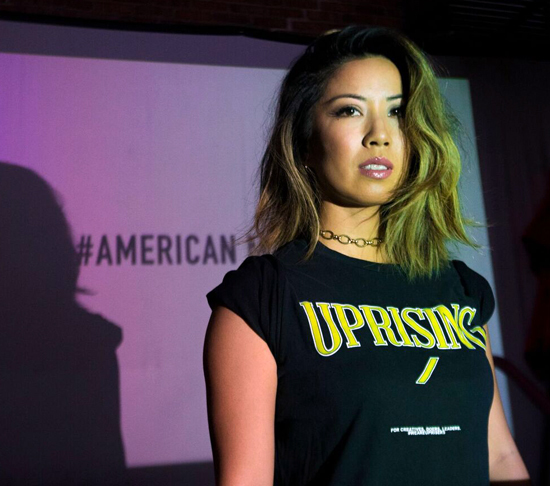 With this perspective in mind, Michelle Hanabusa created Uprising, her own fashion brand, not only to sell quality apparel, but also to establish a community that gives others a voice where they did not have one before. Through two jobs with big corporate companies in the fashion world, Hanabusa began to have a greater understanding of the dynamics in workplaces and the hierarchies of different positions. However, she felt like she and many others did not have the space to share and execute ideas that they had. Thus, when the opportunity called, Hanabusa founded Uprising to change the culture and empower others. Hanabusa, 27, graduated from USC with a degree in fine arts and an emphasis in design and a minor in advertising. 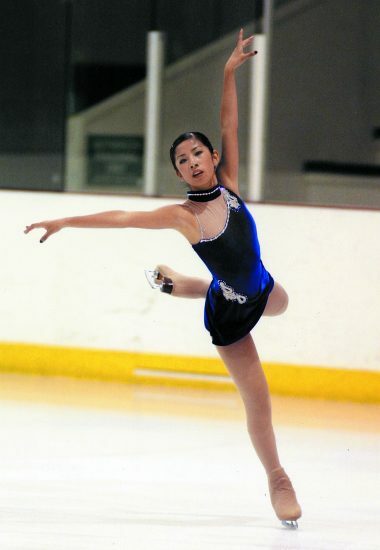 For 16 years she competed in skating and was a member of the USC Figure Skating Club. As someone who loved dabbling in creating things out of nothing, she designed figure skating costumes when she was young, remade and resold products from vintage stores in high school, and created things for different fraternities and sororities throughout college. Hanabusa and her story grace the cover of The Rafu Shimpo’s 2018 Holiday supplement, out Saturday. “My lifestyle and upbringing prepared me for Uprising more than anything else. I trained for over 15 years as a competitive figure skater and I designed all those sparkly, leotard-looking dresses I’m sure you’ve seen on TV — my mom used to spend sleepless nights sewing and remaking them based on the changes I wanted. Bless her heart!” Hanabusa recalled. 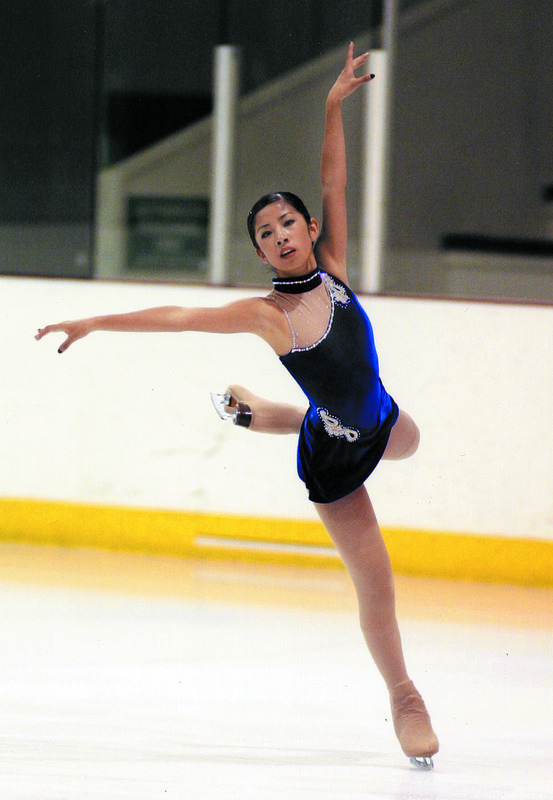 Skating taught hard work and discipline, but it was through joining the Nisei Week Court in 2015 that she found her connections with the Japanese American community. “When I was growing up in the skating world, everything was solo. Coaches training only you for a few hours a day. It can be pretty isolating in a way,” Hanabusa said. “The reason I wanted to participate in Nisei Week is because I felt detached from my own culture. Hanabusa launched Uprising last November. By utilizing a direct-to-consumer model, her company now boasts two manufacturing facilities in Compton that handle all orders from across the nation. One thing is for sure — a journey that used to be a dream has turned into a reality, but the struggles of being an entrepreneur prove that dreams don’t necessarily come without pitfalls. Hanabusa counts as influences the Japanese designer Rei Kawakubo and Steven Alan. She said her target audience are young professionals looking for well-made designs that are functional but also on trend. The 341 FSN pop-up includes a new shirt featuring an archive image of her grandfather, Isamu, and his sister Sachiko, who perished after bombing of Hiroshima in August 1945. Available in limited quantities for $35, only though Jan. 4. “I want to buy something that is well made that after a few washes doesn’t just unravel. Uprising is for someone who wants to look cool and trendy but at the same time, have the multifunctionality, with technology such as moisture wicking/dry fit for the on-the-go lifestyle,” she said. 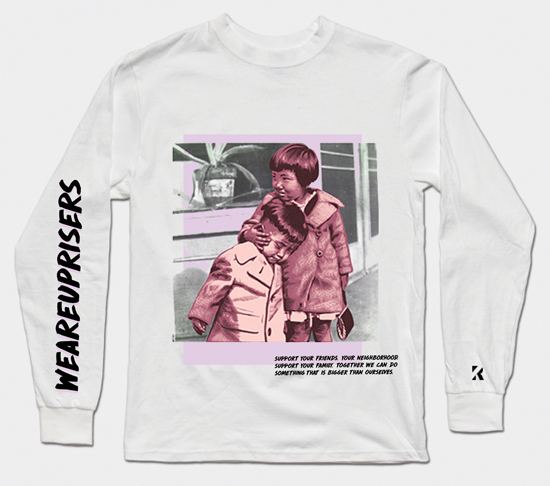 Uprising is about more than fashion. Utilizing social media, the brand has shared messages of empowerment and social responsibility. In May, the American Made project included photographing 600 people from across the country. The images were shared on social media with a shirt that said “American Made” to celebrate diversity and encourage unity in a country that feels very divided. With her vision to become more than just a clothing brand, the movement is fitting as they are able to utilize their platform to deliver a message that they hope can deliver change on a societal level. For the 341 FSN pop-up, Hanabusa has created a new shirt with a message of family. The image is of her grandfather Isamu Hanabusa and his sister Sachiko, embracing one another as children. The tragic poignancy of the image is revealed when Hanabusa shares that Sachiko passed away in the aftermath of the bombing of Hiroshima in August 1945. At a recent photo shoot at Far Bar in Little Tokyo, it is apparent how important family is for Hanabusa. 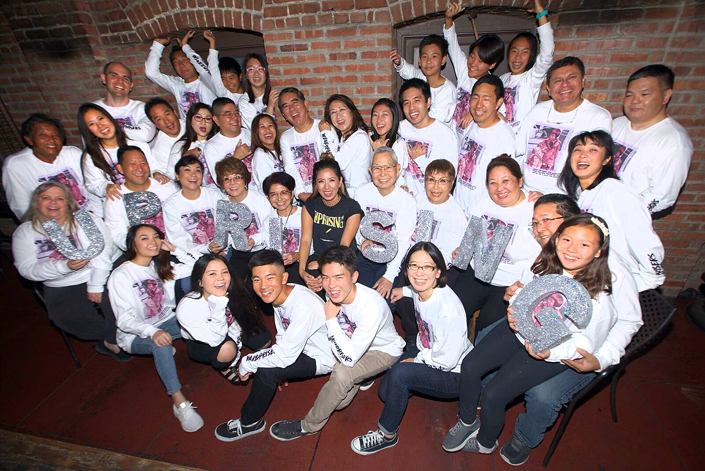 A huge gathering of cousins, aunties and uncles, all in white Uprising shirts, turned out to support the young designer, as well as parents Masami and Shinko Hanabusa. Shinko noted that Michelle has always been interested in fashion and that starting her own business is the fulfillment of a dream. “She doesn’t think it’s a hardship. She takes it as an exciting challenge to pursue her dream,” Shinko said. The amount of work that is associated with the job is not the only struggle that the job has posed in her ascent to success. As a young, Japanese American female entrepreneur, there have been plenty of challenges that have stemmed from her background, particularly her gender. Hanabusa has shared her stories with students and other aspiring entrepreneurs. In November, she spoke at an event in Shibuya, Tokyo for female entrepreneurs. With all of the attention and success that the brand has garnered, Hanabusa maintains a humble mindset and is determined to not settle at the level her company has reached. “I’m never 100% satisfied. I have that mindset of ‘what’s next?’ A lot of my friends tell me to step back and see all of the things that I’ve created so far, and I try to do that, but we are in such an infant stage right now that there are still a million things I want to get done, but I think it’s possible,” she says. The journey certainly has not been easy, but the relentless passion and work ethic that Hanabusa displays have helped her company blaze its own path and leave its mark on the industry. As an entrepreneur who has overcome many challenges, particularly in regard to gender, race and age, her story can serve as a motivation to those who are in a similar position. Regardless of the circumstances people face or the experience they may have, Hanabusa encourages others to not be afraid to take a risk. Uprising will have their first ever Little Tokyo pop-up from Wednesday, Dec. 5, through Friday, Jan. 4, Tuesdays – Fridays 4-10 p.m., Saturdays 1-10 p.m., Sundays 1-8 p.m. (closed on Mondays) at 341 FSN, 341 E. First St., Los Angeles, CA 90012. This opportunity is made possible by the Little Tokyo Service Center Small Business Assistance Program + @LASmallBizcubator. Part of the #MyFSN campaign the pop-up aims to invite entrepreneurs into Little Tokyo and be part of the legacy of Little Tokyo’s small-business community.